In 2018, all over the world, French and Francophone scholars are celebrating the official 50th anniversary of the “May 68 Events,” a student and popular uprising that marked the coming of age of the baby boomers and the transformation of post-war France from a mostly rural and agricultural traditional society to one that is modern, urban, and consumer-oriented. In the 70s and 80s aspects of this movement progressively found their way to the United States and Canada under the general label of “Continental Theory.” The continental invasion was not limited to the two coasts. As a matter of record the traditional Ivy League Schools resisted this continental invasion and the main propagandists of this new French humanism were found in the Midwest at the University of Wisconsin, the University of Nebraska, the University of Michigan, and the University of Minnesota, only to name a few key locations. The University at Buffalo was a great place for this new generation of French intellectuals to visit; traces are found in our local archives of the extended visits by writers, poets, philosophers, film makers and feminist intellectuals including Michel Foucault, Michel Serres, Louis Marin, Michel Deguy, Max Milner, Danièle Huillet, Michel Butor (Mobile ends “at home”: Buffalo! ), René Girard, and Hélène Cixous. 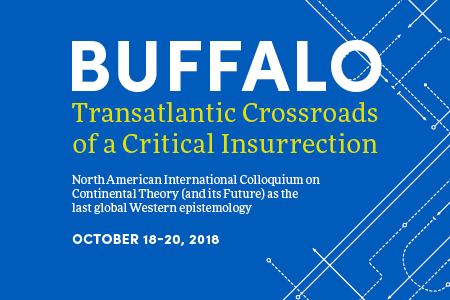 This North-American Colloquium will encourage dialogue between invited guests who will bring testimony of the many aspects of the “Continental invasion” and additional speakers who will be present to discuss both the historical beginnings of this new epistemological trend in US intellectualism and the current version, the XXth-century avatar of the new progressive and liberating Humanism. FREE and open to the public, registration required. Shuttle service from Buffalo Marriott Niagara to Darwin D. Martin Complex departs at 4:00pm. Please email huminst@buffalo.edu if you would like to reserve a seat on the shuttle. A conference room rate of $129/night is available to attendees for check-in on 10/18 and check-out 10/21/18. Hotel room rates are subject to applicable state and local taxes (currently 8.75% NY Sales Tax and 5% Erie County Hotel Tax( in effect at the time of check-out. Conference sponsors: UB Humanities Institute, Department of Comparative Literature, Department of Romance Languages and Literatures, Department of English, The Eugenio Donato Chair of Comparative Literature and the Melodia E. Jones Chair in French (University at Buffalo). The French Cultural Services in the US.